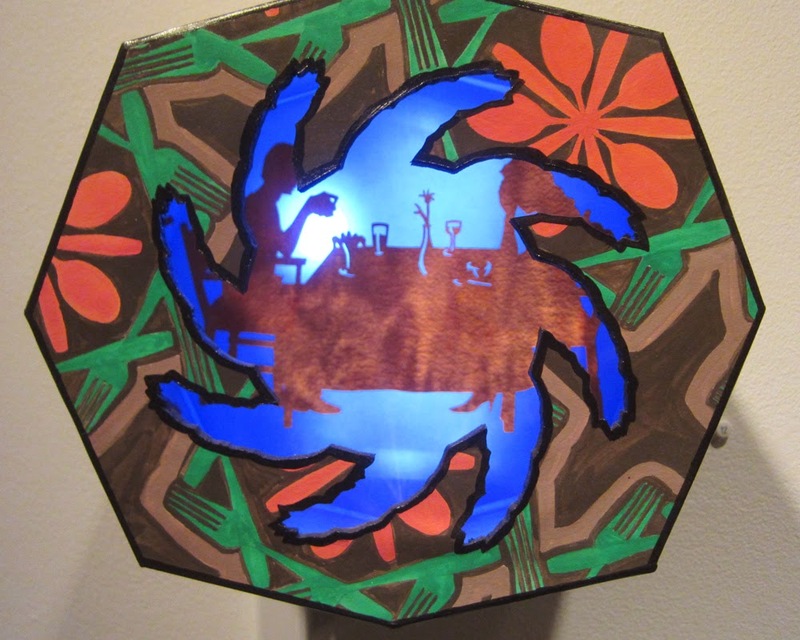 Melanie Kehoss' wonderful exhibit, Glow Tableaux, will be in the Artisphere's Terrace Gallery only for a few more days. The exhibit closes this Saturday, August 23. If you haven't yet seen Glow Tableaux, it's definitely worth a go. These daedal, filigreed boxes glow preternaturally. They tell multi-layered stories. One of the most intricate pieces conceptually is entitled "How to Embarrass Your Date 2010." The artist has depicted her date taking a picture of his shrimp cocktail at a fancy restaurant. He then posted the photo on Facebook. That guy surely would be very embarrassed to see this tableau hanging in Artisphere. But embarrassment is temporary. These tableaux make the mundane glow with eternal beauty. Thanks for the press and the kind words!